Whether you’re training to lose weight or for your very first marathon, running is an awesome way to get in shape and maintain good health. It’s good for your waistline, your heart, and even your brain. At the same time, running comes with a certain degree of injury risk. The high impact repetitive nature of the sport can place a lot of stress on your joints, especially the knees. As a matter of fact, surveys show that up to 70 percent of runners may experience knee issues at a point. 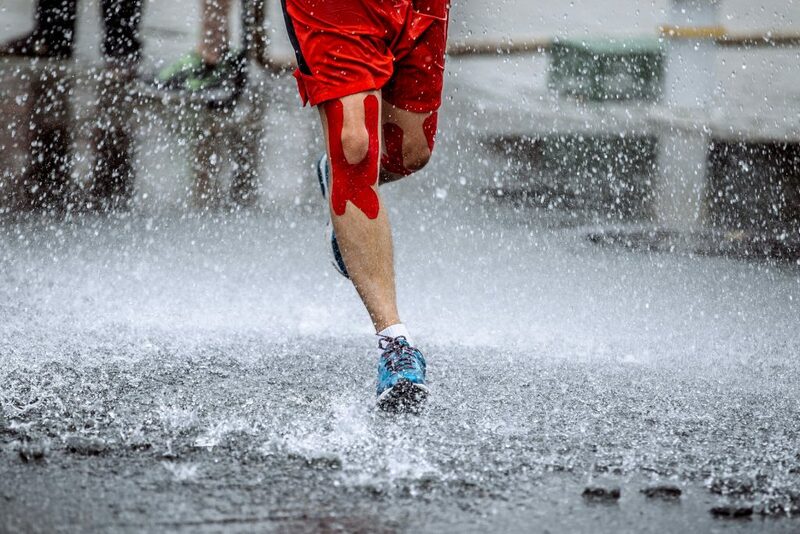 That’s why for some people running is synonymous with knee pain. 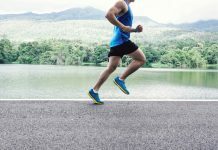 This is especially the case if you drastically increase your running mileage too quickly, train with bad form, wear the wrong shoes, or have muscle imbalances—common training blunders among all runners. But is that enough reason to stop running altogether? Here is the little secret. All you got to do is protect your knees from the get-go by taking some of the following injury prevention measures. The foot is a very complex part of the human anatomy. It’s made up of 19 muscles, 26 bones, 107 ligaments, and 33 joints—and these take the brunt of a foot strike when running. Since running is a high impact sport that places a great deal of stress on the knees, wearing the right trainers not only helps you to run faster and longer, but may also reduce risks of pain and injury. A good running shoe is designed specifically to diffuse the load shooting up the rest of your leg. By training in improper shoes, you might increase risks of knee pain (and other issues)—and you don’t want that. Just don’t get me wrong. I’m not suggesting that proper shoes are the ultimate solution to your knee issues. But it’s a start, and an important part of an overall prevention and treatment and plan. That said, I should also point out—and this may surprise some of you—that the current research on the effectiveness of running shoes in improving performance and preventing overuse injury is, at best, mixed. This link provides you with more insight on the subject at hand. Yet, in my experience, a proper pair is non-negotiable—regardless. Therefore, to stay safe, you got to find a shoe that fits your feet properly. More importantly, go for a pair that supports your natural foot type—whether you’re neutral, high arched (supinator), or flat-footed (overpronator) runner. To find a suitable pair, head to your local running store and ask for a foot type and gait analysis, which will help you find what best matches your physiological and training needs. Also, be sure to replace your trainers regularly. The more miles you run in a pair, the more worn down the shock absorption becomes. This increases the load stresses shooting up your legs, which, in turn, could result in knee pain. As a general rule, change your running shoes every 400 to 500 miles—depending on your training intensity, body weight, running terrains, and personal preferences. Strength training is good for you. If this is news to you, you have a lot to catch up to. I have already written extensively on the importance of strength training for runners here. More specifically, a good strength routine can do wonders for preventing knee pain—and all sorts of overuse injuries. For instance, if the muscles of your lower body are weak, then it’s your joints—mainly the knees—that take the brunt of the impact of each pounding strike. One example is a study published in the Journal of Athletic. In the research, almost 80 percent of runners with knee issues reported experiencing less pain after three to four weeks of hip and core strength training. Another research published in Medicine & Science found that female runners with patellofemoral joint pain —a notorious overuse injury colloquially known as “runner’s knee” —had a deficit in hip external rotation, abduction and extension strength, when compared to age-matched injury-free runners. So, to avoid the pain (or to keep it from creeping back), spend time doing strength training exercises that target your lower body. Specifically, exercises targeted at your knee stabilizing muscles. These include your hips, glutes, hamstrings, quadriceps, and calves. Here are some my favorite routines. When dealing with knee pain, don’t overlook the power of diet. As a runner, you’ll need the right nutrients and substances to help protect your cells from damage and maintain healthy joints. For starters, get plenty of calcium. Most experts recommend 1,100 to 1,300 mg of this mineral each day. Dairy products and dark green veggies are some of the ideal sources of calcium. Here is the full guide to calcium foods. Another nutrient is omega-3 fatty acids. These fatty acids are natural anti-inflammatories that can help ease joint inflammation before it damages the joints. The best sources of omega-3s include salmon, herring, tuna, cod, sardines, and mackerel, as well as fish oil supplements. Furthermore, you might need to supplement. Many athletes take Chondroitin sulfate and Glucosamine supplements to deal with joint pain since it’s believed that these encourage cartilage formation and repair. However, the research is still mixed on the effectiveness of the supplements, so consult a certified physician if it can be helpful to your case. Most experts recommend a minimum dosage of 1,200 mg of Chondroitin sulfate and 1,500 mg of Glucosamine daily. If your knees are in pain while running, it could be that you need to change your form—more specifically, your trunk position. In fact, according to this research paper published in Medicine & Science in Sport & Exercise, an increased trunk flexion may decrease compressive forces on the patellofemoral joint. In English: a slight forward lean while running reduces the load placed on the knees, which, in turn, cuts the risks of discomfort and injury at the joint. Opting for a slight forward lean while running may help shift your weight from the knees to the hip, thus reducing impact forces on the knees. That said, getting the slight forward lean right is a bit tricky. Make sure that the lean, or the “fall,” is coming from the ankles, not the hips. It should feel almost like you’re falling forward. You should not feel broke nor bent at the trunk. Allow your torso to come a bit forward—at least seven to ten degrees, according to the before mentioned research—while simultaneously flexing your hips and lower abdominals subtly. In other words, opt for a mild lean, not a complete bent-over position. Think skiers stance. Another technique tweak to consider when dealing with knee pain from running is to to avoid overstriding. When you do, you’ll be slamming your foot down, creating a braking action with each stride. Then, all of these impact stresses of hitting the ground goes right up your feet to your knees. This, in theory at least, limits your efficiency and increases your risk of injury. As a result, most experts agree on the fact that overstriding is bad. Do not let your feet get ahead of you. Make sure to stay ahead of your feet. Do not let your legs swing forward, not to the rear. Reducing stride length can put a stop to overstriding, thus decrease injury risk, research shows. And one of the best ways to do so is to simply increase your cadence. In fact, research conducted at the University of Wisconsin found that an increased cadence reduces the impact load on the lower body. Determine your current cadence by counting how many times your feet hit the ground in one minute of running. If it’s over 160, you’re in the clear. But, if your cadence is below 160 steps per minute, they should increase it by 5 to 10 percent from one week to the next. For the full guide to improve running cadence, check my article here. Doing too much too soon is the recipe for knee pain—and all sorts of injury. In fact, whether you’re motivated to lose the pounds as soon as possible or have just signed up for a race, it’s important not to increase training intensity too abruptly. Instead, ease yourself into running, regardless of how incentivized you feel. Start with low to moderate intensity runs for shorter distances, then progress as you feel up to it—not the other way around. One simple rule is to follow the ten percent principle—do not increase your weekly mileage by more than 10 percent from one week to the next. Also, be sure to take enough rest—when needed—to allow for proper recovery. Furthermore, listen to your body and train accordingly. So, for instance, if you’re experiencing knee pain, back off and assess what you’re doing. In fact, stop running whenever you’re experiencing knee discomfort or pain. To deal with the pain, opt for the PRICE method. Protecting the affected knee from further injury—for example, by using a support. Let the affected knee rest by avoiding high impact exercise for a few days. Ice the injured knee for 15 to 20 minutes, three to four times per day. Compress the affected knee by using a wrap, a splint, etc. Elevate the affected joint above heart level to reduce swelling. If pain persists, seek medical help ASAP. Dilly-dallying with knee pain will only make your case way more severe—and that’s not something you’d want to. You are a smart runner, aren’t you?